1. What kind of document is this? 2. Who created this document? 3. In what historical and organizational context was the document produced? 4. Who was the primary audience for the document? 5. How did the document affect the flow of events? a voluntary transfer. The last paragraph states that the document itself is directed toward other governments and assures readers that Nigerias new leaders plan no changes with other countries its foreign policy will continue to be based on non-alignment. The only individual names mentioned in the statement are those of the military governors of different regions of Nigeria. One strategy for analyzing and discussing the document is to number each thought separately. If we do this (see the modified document), then the initial comments made above are easier to follow. The author of the document appears in line 2 and the assertion of legitimacy occurs at both the beginning and the end of the document (lines 4 and 53). The intended audience of the statement is presented in line 56 and the list of regional commanders is offered in line 38. Now apply the rest of the analytical questions to the document. The document, in the restrained language of diplomacy, tells about a change of government in the nation of Nigeria in January 1966, as the result of a military takeover of a constitutional government. For example, lines 5-12 describe growing civil unrest including rigged elections (line 9) and rioting (line 11) that made up the background of the events of January. Lines 13-19 describe the actual January crisis (assassination of two regional Premiers, for example, line 16) while lines 20-27 present the actual transfer of power to the military to save the nation and restore stability (line 23). Taken collectively, this first part of the message is the justification for a military coup by the loyal majority of the army (lines 17-19) to thwart a coup by certain army officers (line 12). Lines 28-46 describe a number of internal governmental changes that make little sense to the reader without further analysis but which were very important for Nigerians. Lines 47 through the end of the document comprise the actual message from the new government to other governments around the world: that the coup has the support of all Nigerians (line 54) and that the military leaders envision no changes in their countrys relationship to the rest of the world (lines 49 and 50). The Foreign Ministries, the agency that circulated this document to Nigerian embassies, is charged with carrying out their normal functionswith the added note that this group now reports directly to the Federal Military Government. What is the historical context of this coup? In 1966, Nigeria was only a few years removed from colonial status. Although the British people or their government had intervened in the area that became Nigeria from the start of the slave trade era, Nigeria as a unified political and economic entity had only been established in 1914 with the merger of the very different regions of northern and southern Nigeria. Faced with a Nigerian colonial population comprising almost 200 different ethnic groups loosely divided into Muslim, Christian, and traditional religions, the British resorted to a policy of indirect rule in the 1930s. This strategy involved working with multiple traditional leaders rather than imposing a direct British system administered by a blend of British and collaborating Nigerians. 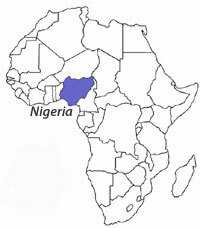 After Britains costly victory in World War II, which left that nation financially strapped, the British moved relatively quickly to establish a less costly, independent Nigeria based on British institutions, the English language, and local control of many issues (a federal system) that might allow for both local ethnic autonomy and a centralized government. This history is clearly present in the diplomatic note. Line 29 refers to a constitution that provided for both a parliament (suspended as a result of the coup) and a prime minister (also suspended) while the next line refers to the suspension of a wide range of provisions related to the regional governments that were more directly connected to the diverse peoples of Nigeria. There are also broader issues of context. After much of Africa made the transition from colonies to independent states in the 1960s, had the European colonial powers adequately prepared the colonies for independence? Had these same powers provided only political power while continuing to control their economic interests? The 1960s were also a major decade of the Cold War; world events were analyzed for their impact on the global balance between the United States and the Union of Soviet Socialist Republics. These factors underlie the assurances in the note that Nigerias foreign policy will continue to be based on non-alignment (line 57) and that it will honor all prior financial and diplomatic agreements (lines 48-49-50). This document was written in the midst of a moment when many issues were uncertain in Nigeria. Note the verb tenses in this document: the structure of the Executive Council will be announced later (line 32); the foreign ministries will be responsible to the Federal Military Government when constituted (line 33); the government is determined to suppress unrest (line 44); that the government will declare martial law if needed (line 45); and it is the intention of the government to maintain law and order (line 46). Obviously the new government has a lot of work to do in order to establish internal stability in Nigeria. The purpose of the document is ostensibly to assure the world outside Nigeria that events inside the country are moving toward stability, and that relations with the outside world are not going to change and, therefore, outside powers should not fear a sudden change in the global balance. Support for this generalization rests in the assurances of the widespread acceptance of the military government within Nigeria: the military was invited into power (line 4 and again in line 26) because the vast majority of the military remained loyal to the constitutional government (line 18); leaders from all segments of society have expressed their support for the new arrangement (lines 54 and 55). Collectively this list of assertions presents the image of the rebels as isolated from the core of society and on the verge of being neutralized. The purpose of a document often points toward its true audiences. In the first place, this document serves a basic diplomatic purpose. The assertion that the Federal Military Government is firmly and clearly in charge is prerequisite for diplomatic recognition of a new government. The military government claims its power derives from the invitation from the constitutional government to take over the administration of Nigeria. If this group can show that it has a legitimate claim to power and is actually in control of the internal situation, then it can expect continuing diplomatic recognition from other nations. If the government is not regarded as legitimate or not in control of the territory of Nigeria, then outside governments could consider intervention or covert support for one faction or another within Nigeria. The core assertion of this diplomatic message is that all is (almost) well in Nigeria: the central government is in good hands and widely supported, even though aspects of the national constitution have been suspended by military leaders. The ethnic diversity of Nigeriathe basis of the division of the nation into the regions repeatedly mentioned in this documentappears to be less significant than the overall control provided by the central government. Is this document a record of a momentary youthful indiscretion of a young Nigeria on its path toward full independence in a world of nation-states? Or is it a harbinger of future disorder for the country? In fact, the litany of challenges presented and dismissed in this message to world governments actually represent the outlines of Nigerian history for at least the following 30 years. The nation was immersed in a civil war within a year as the Eastern Region of Nigeria proclaimed its own independence and attempted to secede from Nigeria. This effort came to an unsuccessful end in January 1970. In the years since, Nigeria has moved from a nation of four regions to one of almost 50 regions in the effort to give diverse ethnic groups a home that they can govern at the local level. Furthermore, the nation has alternated between long-term military dictatorships and short-lived attempts at representative government. This document had no author. We dont know if the Foreign Ministry acted on its own, or if the message was initiated by military leaders. Still, a close reading of the document, coupled with some references to the context of the times, transforms this routine example of diplomatic correspondence into a window on Nigerian history and its ongoing challenges.